Lucerne Festival - Roger Federer: Racket vs. Violin? 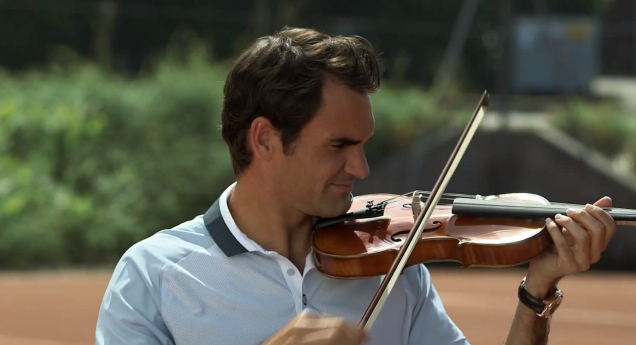 In the latest TV spot by Credit Suisse, Roger Federer sits down on the practice court, taking out two racquets, and then takes out…a violin. He attempts to play but his musical talents aren’t quite as smooth as his tennis, so he congratulates the Lucerne Festival’s 75th anniversary, noting that he will practice violin for 25 years and maybe play at the 100th anniversary. See the video and press release below. Roger Federer congratulates the Lucerne Festival on its 75th Anniversary. The Lucerne Festival is one of the world’s leading classical music festivals which takes place each summer in Lucerne, Switzerland. To celebrate the 75th Anniversary of the Lucerne Festival, Credit Suisse, as a Main Sponsor since 1993, invites partners and friends to congratulate them with a short video message on Facebook. Visit the Credit Suisse Facebook page to take part in our competition to win a VIP trip to the 2014 Lucerne Festival. Competition ends September 15, 2013.